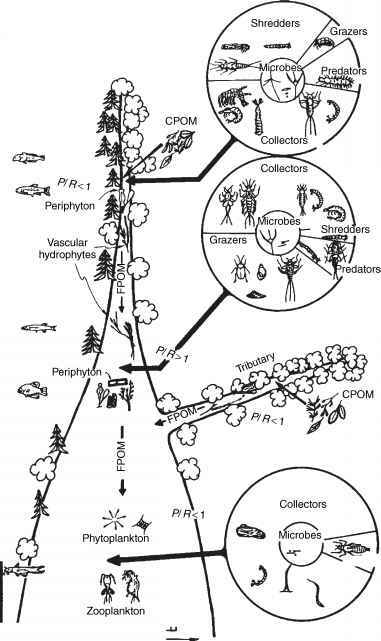 Microcosms are microecosystems. They are small, multi-species systems, consisting of a subset of the biotic community and abiotic properties of a larger ecosystem and have the common features of ecosystems such as food chains, production-consumption cycles, and hierarchies. A microcosm is a simplified, physical model of an ecosystem that enables controlled experiments to be conducted in the laboratory or in situ. They are often, and best, used in conjunction with theoretical mathematical models and field observational studies as part of a broader research strategy. Artificial microcosms are wholly or partially isolated from the external world in containers. Some natural microcosms also exist such as a phytotelmata (a contained aquatic habitat formed by a plant and populated by aquatic organisms, for example, bromeliads, tree holes) and communities confined to rock pools and moss patches. Artificial microcosms may be derived directly from nature or gnotobiotic. Derived microcosms typically simulate a specific natural ecosystem, using species and components from it, and the exact species composition, particularly with respect to microorganisms, is unknown. In contrast, the exact species composition of gnotobiotic microcosms is known with these normally containing a set of physiologically well-studied species from pure (axenic) cultures that may or may not be normally found together. Microcosms are similar to mesocosms but on a smaller scale (see Mesocosm Management). There are no strict definitions to delineate microcosms from mesocosms. However, microcosms are often considered to be structures of laboratory-bench scale while mesocosms are room size or larger. Due to their smaller size, microcosms are generally easier and less expensive to construct than mesocosms but as a result are often simpler systems that can only accommodate smaller ecological subjects, up to the size of small plants and animals (e.g., grasses, invertebrates). The term 'macrocosm' is sometimes used to refer to the larger, natural ecosystems that the micro- or mesocosm system attempts to model.